Do cities remember? Maps of cities are flat, yet their histories contain vertical strata of events. 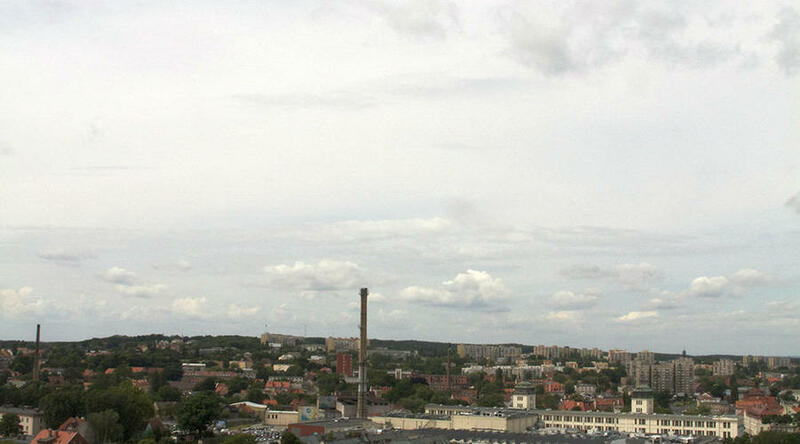 Where in the topography and consciousness of a city can we locate its memory? Maps of the Polish city Zielona Góra depict an empty unmarked rectangular area located on Wrocławska Street, across from the Focus Park shopping mall. 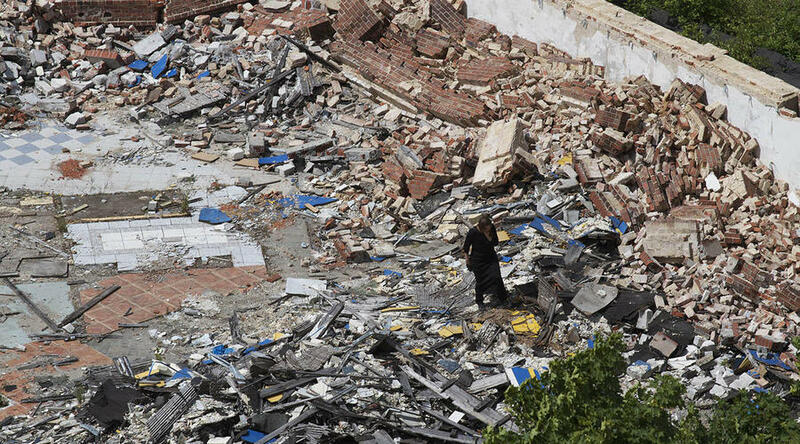 Located centrally within the city this area looks abandoned, being composed mostly of broken masonry and wood debris. 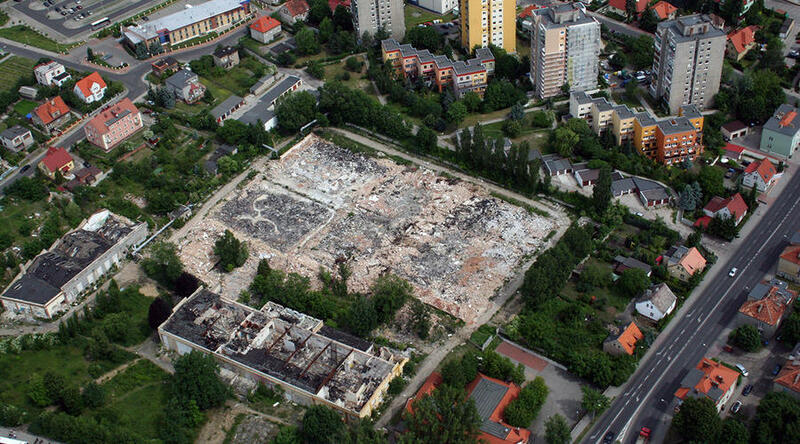 Inquiries to citizens of Zielona Góra indicate that many of them do not know the history of this abandoned area, including those who grew up near the site. On June 9th I flew on a small airplane to film this territory and its surroundings. 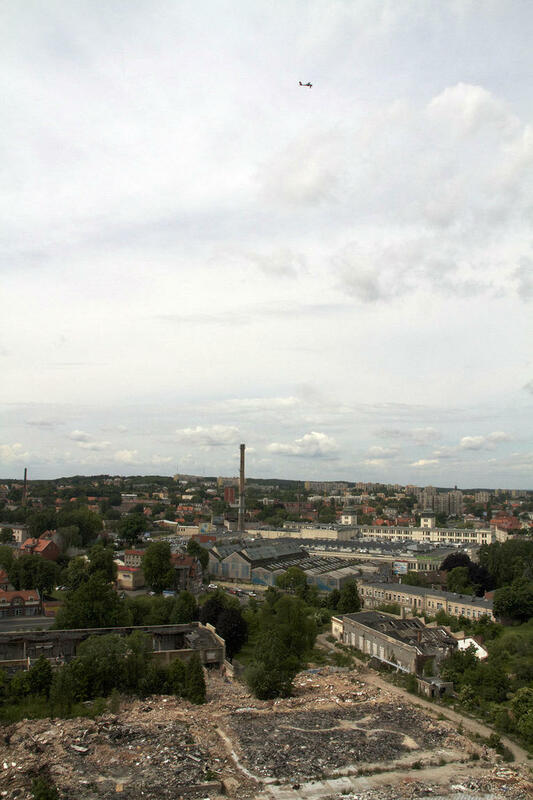 The flight marked the beginning of my new project that will eventually develop into a multimedia dialogue with the citizens of Zielona Góra.During the Second World War the site was a forced labor camp, which later became a concentration camp designated primarily for Jewish women. The camp was developed on the site of the German wool factory, Deutsche Wollenwaren Manufaktur AG,which supplied the German war machine with military clothing. (It has since been converted to a shopping mall.) During the war about 1,000 young women worked there as seamstresses and eventually became prisoners of the concentration camp complex governed by KZ Groß-Rosen. Towards the very end of the war the prisoners were sent on one of the most tragic of the forced Death Marches where many of them died. Looking down from the airplane we see well-kept buildings surrounding the ruins of the former camp, as though it were an open yet forgotten wound in the body of the center of the city. During the performative phase of the project, a group of young women from Zielona Góra spent some time in silence on the site of the camp, evoking the absence of the prisoners through their presence and performing minimal gestures of lamentation. 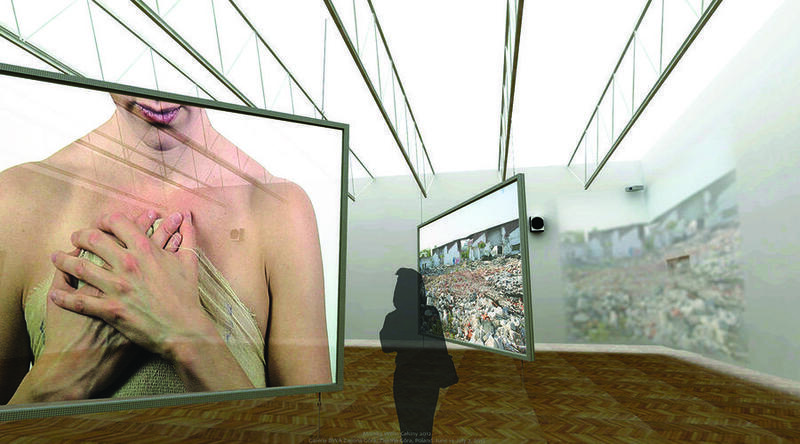 In the video projection screening--my exhibition at the BWA--the faces of the young women look towards us in silence. 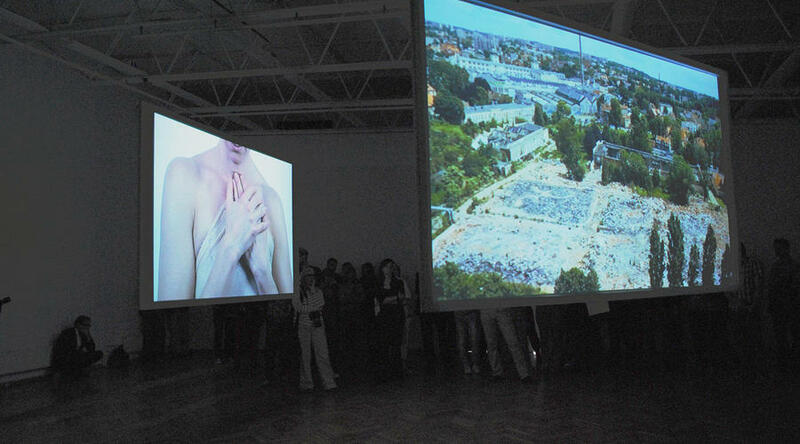 Another suspended projection screen shows a young woman wrapping bandages onto her chest in a gesture of defense, or perhaps caress. Her body stands for our common body, anonymous as if it were a membrane between the self and the external world. Awareness of our marginality becomes elevated into the realm of meaning through our brief encounter with memory and history. “Shrouds”considers aspects of public memory and amnesia in the construction of the space of a city and its urban planning. As part of this project,citizens of Zielona Góra are invited to propose how we choose to remember, (or not) the women prisoners who perished there, and how this fulfilled the goals of a systematic destruction of an entire population. Visitors to the exhibition will be invited to respond to a questionnaire in order to propose their own ideas for the development of the area, whether as a site of commemoration, or through other forms of dialogue.